Getting your home-based online business to new heights can be a frustrating journey for most entrepreneurs. There is the adage in online marketing lingo that goes, “Always be marketing”. This is entirely correct because a small lull in your marketing efforts could see your sales fall drastically short. Planning your marketing well will ensure the smooth operation of your business. Too many times, you know unplanned strategies bring in so many customers, that the owner gets burned out trying to fulfil the orders, or burn profits hiring people to help meet this massive increase in demand. It is quite tempting to try and offer many services or products to your customers in an attempt to increase sales. The folly here is that you may end up diluting your products and services, confusing as to which products a customer may buy. It is one thing for a huge website company to have a full catalogue of tens of products since they have the workforce to handle massive sales. A home-based business does not, and you need to market one product or service at a time. So finally you have found the best product combination for your home-based business, and sales are doing well. You may now go a step further and offer complimentary goods and services to increase your sales even further. Your customers have a wider selection of items to buy, and your product is more appealing, especially to retailers. Retail customers end up buying your products to offer as gifts to loved ones, and your wholesale customers will stock more from you since you have complementary product lines. It costs less to increase sales from existing customers than finding new ones. You may do this by giving volume discounts, especially if your production costs are low. If you offer your products two items at the price of one, you will see your sales increase further. You may also use loyalty cards to reward customers for shopping on your website. This has been successfully used by big retailers, and it can also work wonders for small businesses too. This is one way of freeing up your cash flow and also getting the much-needed help you need to handle increased sales. You can get a freelancer and even your family members to help out for a small fee. This way, you get an extensive network of helpers without the huge financial outlay that you would need for hiring in-house staff to do the same tasks. Outside help also offers you a way of discussing your ideas with someone with a different perspective from yours. This may end up improving the product, service, marketing and sales process that you are using. You may not have the sales volumes to warrant setting up an affiliate network, but you can easily network with non-competing businesses within the same niche. If you are making bath salts and spa products, you can partner with fitness clubs who can offer your products to their members at a discount. You can also offer to improve the membership of the health club by providing discount memberships for people who buy products from your store. The possibilities are endless when it comes to partnering in such a manner. You may be having a product that is a hit with moms who go to work, so targeting stay-at-home moms could be the next stop for you. If you are selling items to high school students, you may try to target college students too. You may also think of putting your retail items on wholesale to improve the sales volumes. This may force you to adjust your pricing, but the improved volumes will make up for this dip in price. Get a newsletter to keep your customers updated on developments within your business, products and services. You can also join social media to interact with some of your existing and potential customers. You can also look at your chamber of commerce and local community groups to disseminate information about your business. You do not need a massive investment to take advantage of some of these avenues of marketing. Now, this is something that most business owners are aware of, but hardly pay attention to. Your website needs to be optimised for the search engines and your customers. Information must be easy to read; the checkout process must be fast and safe; the website should be able to respond on a mobile device, given that people are always using them for buying things from the Internet. It might be wise to invest a little more in optimising your website, so you are easily found by potential customers. It is beneficial to show people that you are an authority when it comes to the products and services in your niche. By blogging, you let people get to know you on a personal level. Talk about your products and services and how they can be used in the daily lives of your potential customers. 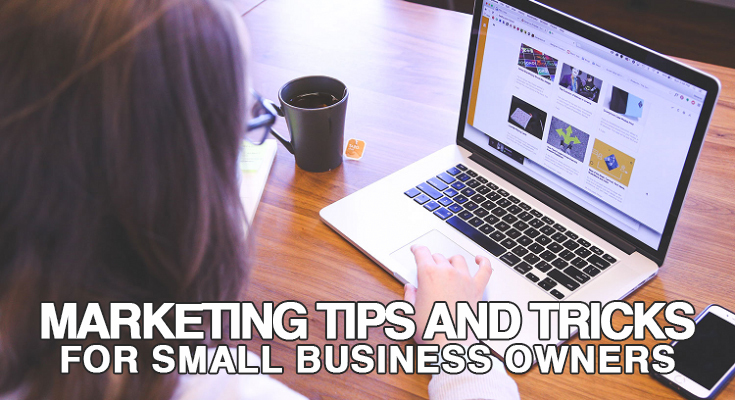 These tricks and tips for online marketing are just some of the things that you can try to boost your business. The possibilities are wide and varied, and you need to read more about small business marketing ideas. New ones are evolving everyday, so you need to keep abreast of new marketing techniques for small business owners. Your business will flourish, and you will reap the rewards of being a home-based entrepreneur.